Helium-filled balloon with durable outer covering. Many styles from which to choose. Ordinary balloons are made of a disposable laytex material. They break after two or three days of use and need to be replaced. Our "SunSeeker™" uses a durable two layer system. The inner layer is made of tough, flexible PVC and the outer layer is made of a washable heavy-duty nylon material. 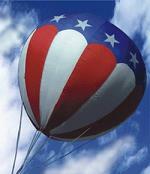 They stay inflated and fly high for up to 15 days. With proper care they can be reused hundreds of times for up to 3 years.